Bean Box delivers a monthly box of freshly roasted gourmet coffee from Seattle’s premier coffee roasters. Subscribers choose whether to receive a full 12 oz. bag of coffee each month or four smaller 1.8 oz. sample-sized bags. 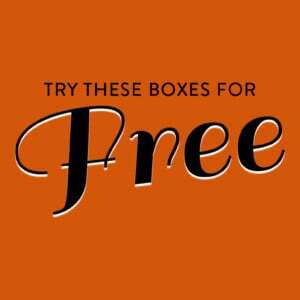 COUPON: Use this link to get your first box free, just pay $2.99 shipping. The Products: Freshly roasted coffee from a selection of Seattle’s best coffee roasters. Bean Box includes an info card that lists the month’s featured roasters and provides a little information about each of them. On the reverse, Bean Box provides brewing tips and tricks to help make sure your beans yield the best possible coffee. There’s also a card with information about how to personalize your subscription. Coffee can taste differently depending on the brewing method. For all of the coffees sent by Bean Box, I ground them using a blade grinder and brewed them using a 34 oz. Bodum French Press (my preferred brewing method). Each 1.8 oz. packet of beans yielded one full pot of coffee, approximately 4-5 cups. For reference, I typically drink medium roast coffee, but I like lighter and darker roasts, too. I sometimes drink my coffee black, but I most often enjoy it with a small amount of milk and no sugar. All of the coffee in my box was roasted on April 6th. My box arrived only three days later, and I really appreciate that Bean Box is able to send coffee that’s so fresh. This was a medium roast coffee from Honduras. Bean Box recommended trying this coffee without milk or sugar because “it brings its own.” I thought this was a fantastic coffee, and, while great on its own, I thought it was also delicious with a splash of milk. Often, Ethiopian coffee is lightly roasted because it typically has a juicy, citrusy quality that can be lost when the beans are darkly roasted. On the bag, this coffee was described exactly like I would expect: a sweet, lively coffee with hints of berry and orange. Bean Box even described the coffee as tasting like tea, which reinforced my expectation that this would be a light roast; however, as soon as I opened the packet of beans I could tell that they were actually very dark. (I wondered for a minute if maybe they’d bagged the wrong beans!) The resulting coffee wasn’t really for me. I thought it was a little bitter, and I ended up adding quite a lot of milk to try and soften the super dark flavors. This coffee was excellent. It’s described as a “true crowd pleaser, with great body, structure, sweetness, and intensity.” I thought it was lively, flavorful, and very smooth. Like all of the coffee in this shipment, I brewed it in my French press; however, Kuma claims that it’s also great as an espresso. I’m planning to order a full-sized bag, so I can try using it in my countertop espresso maker. Beans that are great for espresso AND drip coffee? Yes, please! This Roaster’s Choice is Lighthouse Roasters’ signature coffee. It’s a full-bodied blend of Ethiopian, Sumatran, and Latin high-grown Arabicas. The beans were very dark, almost like a French roast. In the cup, it was bold and strong. While this is a darker coffee than I usually go for, I enjoyed trying it. Bean Box also included a coupon for Hello Fresh and a chocolate truffle from Seattle’s Dilletante Chocolates. Verdict: This is my first Bean Box, and I really enjoyed it! I love trying new coffee, and I think it’s exciting to receive freshly roasted beans from Seattle’s boutique roasters. The value is very low, but I think this box is more about discovering new coffee and roasters than it is about getting a great deal. Have you tried Bean Box? I love Driftaway coffee, $16 for 11 ounces and delicious. I love coffee and like trying new coffees but this box seems overpriced. There’s certainly value to discovering new coffees but $20 for 4 small packets of coffee valued at around $10, a coupon, and a truffle is a pretty bad deal. One 12oz bag might be a little better but, I don’t know, $20 plus shipping still feels like a lot. I understand that it’s a ‘bean’ box but do they offer already ground coffee? I’d be interested in trying this but don’t have a grinder and I’m not willing to buy one just to try out this box. Wow that’s pretty high for ~$10 worth of coffee…. I just signed up, but it costs $3.49 (not $2.99) and I didn’t get the option to choose between one larger bag or 4 smaller ones.